The year 2014 was again financially successful for our fire company. We held three fire company fundraising dinners, had a successful Carriage and Antique Auction, and managed a sold-out Half Marathon event. Due to the success of these events, along with your donations and our township support, we paid all of our operating costs and then set aside nearly $140,000 for our next major fire apparatus purchase currently scheduled for 2020. We’ve made a very conscious effort over the past 10 years to engage our community and ask for your help to strengthen our finances and to build a solid financial foundation for our next generation of volunteers. Thanks to your strong support, we continue to meet all of our financial goals and remain 100% debt free! 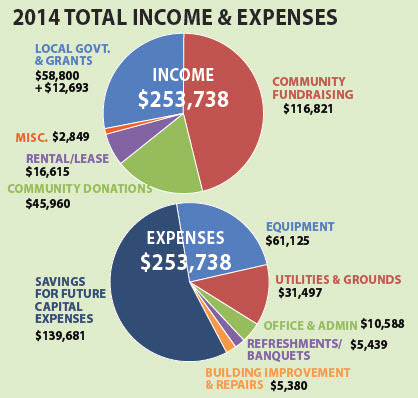 During 2014, over 365 residents and businesses from our community donated more than $45,000 in cash contributions. Our volunteers greatly appreciate your support and we would like to assure you that we will do everything in our ability to use these funds in a responsible manner. Please consider supporting our volunteers again this year by making a generous financial contribution. Thank you for all that you do for our fire company and our community! Did you know that over 70% of the general funding of our 100% volunteer fire company comes from your donations and support of our fundraising efforts? At Bird-in-Hand we have a long tradition of relying on our local residents and businesses for the financial support needed to remain a vibrant and active volunteer fire company. Over the years their involvement has provided the great creativity and teamwork needed to successfully protect our growing community. 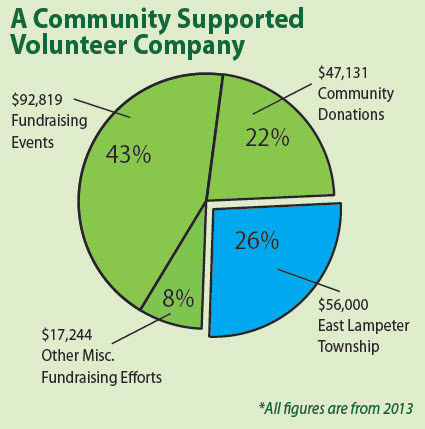 We feel that this broad-based community involvement benefits our area in many ways. First, it minimizes the tax burden for all of us. Second, it keeps us accountable and in tune with what our community expects from their fire company. Third, it allows us to engage the many talented individuals and businesses in our first due area and provides lots of volunteer opportunities for everyone. And finally, we believe it strengthens the fabric of our community as neighbors work with neighbors, hand-in-hand for a common cause. Thank you for your tremendous support of the Fire Company! 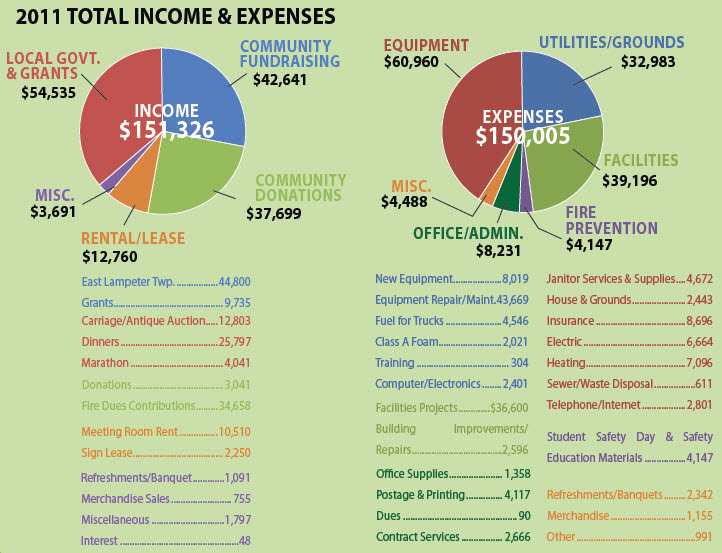 Thanks to the community’s generous support, 2013 was a terrific success financially for the Fire Company! Because of your generous donations and the success of our fundraising events we had a record-breaking year. After paying all of our operating expenses, we were able to set aside an additional $136,000 towards the purchase of our new Tanker. Since our last major capital expense of a new squad and major building renovation in 2008, the Fire Company has been working very hard. Six years later all of that hard work is now paying off. For the first time in the Fire Company’s history we are purchasing a new piece of fire apparatus without a capital fundraising campaign – while at the same time remaining debt free. In 2014 we continue to depend on your faithful donations and your attendance at our fundraising events. Your support is critical to our mission of protecting and serving our community while being good stewards of our local resources. Thank you for helping to make Bird-in-Hand a safe and wonderful place to live. In the Bird-in-Hand community, many individuals step up to the plate and do their part. That is certainly true of the results of our 2013 Spring Fund Appeal. All gifts, no matter how large or small, are appreciated because they add up quickly and help us reach our financial goals. Your generous monetary contributions show your dedication to keeping our community strong. Thank you! 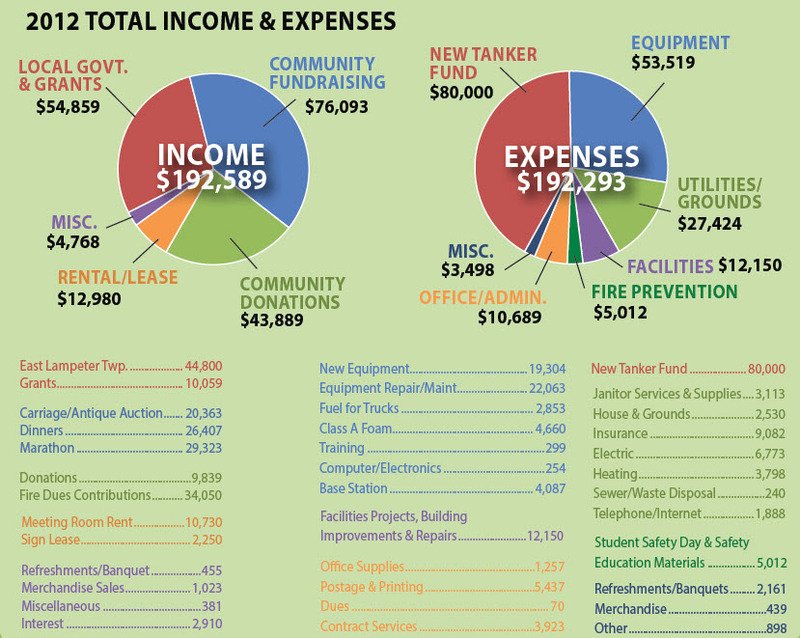 Total amount of fire dues received to date is $33,600. 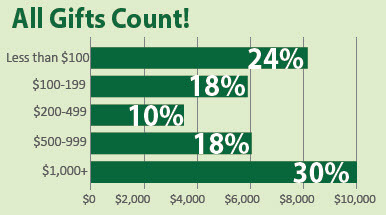 We are on pace to exceed donations from last year by over 15%. Please use the enclosed envelope to submit a contribution if you haven’t already done so this year. *All income over and above expenses goes towards the new tanker purchase. 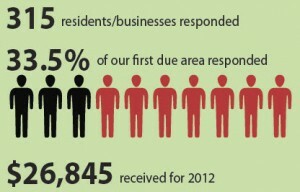 Percentage of Resident Responses to Appeal is Growing! 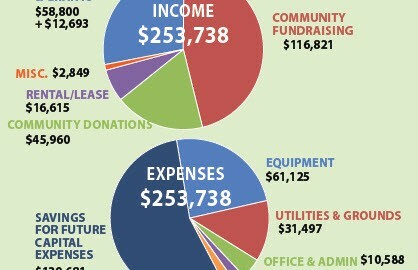 It is with much gratitude that the Fire Company Finance Committee reports that 2012 was a strong financial year. The Bird-in-Hand community has contributed in many ways to this strength. With a truly impressive show of support, 44% of the residents and businesses responded with donations as a result of the appeal letters. This percentage is growing and is making a wonderful impact on our ability to sustain high quality fire protection. Three very successful fundraisers in 2012 were the annual dinners, Carriage Auction, and Half Marathon events. The Fire Company provided the structure and organization and community members generously gave their skills, talents, and time when we asked you to volunteer at these events. By working together on the fundraisers, community members made sure that the events functioned well. Your help released firefighters to concentrate on training and responding to calls. 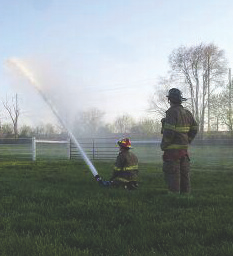 A trademark of our Fire Company is the careful way we make decisions, especially financial ones. We are committed to being good stewards of the funds we have today so that we have resources to maintain excellent service in future years. Thank you for working with us toward this goal. Thank You For Your Heartwarming Response! The Fire Company is grateful for the generosity of the community during our 2012 Spring Fund Appeal. We are pleased to have heard from one-third of you and await a response from those who procrastinated, forgot, or laid aside our Fund Appeal letter in February. Help us achieve a 100% participation rate from the residents in our first due. If you haven’t made a donation this year, please consider using the enclosed envelope to submit a contribution. Thank you for helping us keep excellent fire protection alive and well in our community. 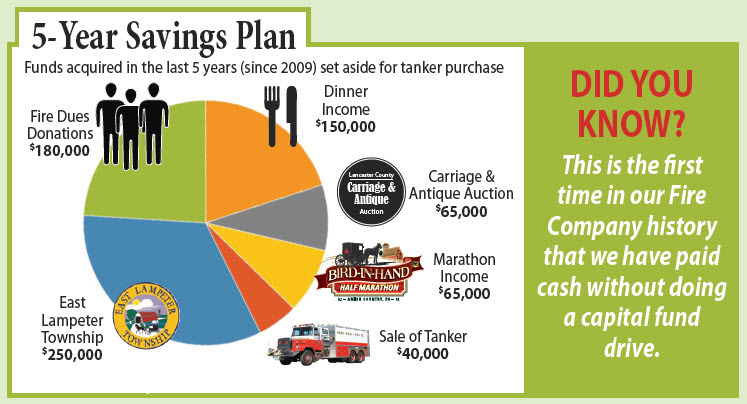 *All income over and above expenses will go towards our new tanker purchase in 2013. Bird-in-Hand is a community of caring, generous people who value the services they receive. We as a Fire Company are committed to doing our part to provide the finest fire protection possible and to be an advocate for safety in general. As we work in partnership with our community, we discover that we can accomplish much more together than any of us can do on our own. Please join with your neighbors to keep our community strong by sending your annual financial contribution to the Hand-in-Hand Fire Company. We are volunteers who give of our own time to fight fires, respond to many other emergencies, maintain equipment, improve the Fire Hall, and conduct fundraisers. Your financial help is a vote of affirmation to us. Last year 40% of our residents and businesses made contributions. We are grateful and take seriously our pledge to be good stewards of your gifts. 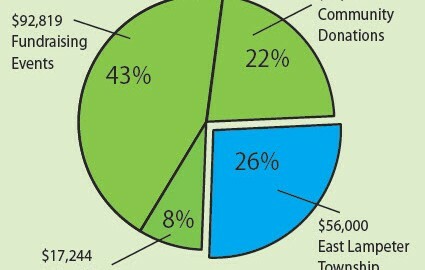 Our goal in 2012 is for everyone to generously give so that the Fire Company can have adequate resources for the future. Thank you for being our partner and for helping to make Bird-in-Hand an outstanding community.